Communities on islands face an out of the ordinary situation when it comes to fire incidents. While the local fire brigades on the mainland can drive to the fire scene and easily can get assistance from the neighbouring fire brigades, this is not possible on an island. For smaller islands, municipalities sometimes do not have the financial resources to acquire a normal fire engine, so they have to be creative about the type of fire fighting equipment they purchase. Also they cannot have fulltime staff on their payroll so they have to rely on part-time or voluntary fire fighters that has another full time job. Also the number of fire fighters enrolled is lower and maybe limited to one person, so the equipment has to be light weight and easy to use. Due to these restrictions on resources, both financially and manpower wise, the equipment must be easy to operate and maintain. The chosen equipment must at the same time be versatile as it has to be suitable for a number of different situations. Two options are the obvious choice for municipalities on small islands, either a car e.g. a station wagon or pickup, or alternatively an all-terrain vehicle. As islands often is less developed, a fair part of their areas is taken up by nature. The fire fighting vehicle should therefore also be able to navigate off-road environments. The Firexpress ATVs serves this purpose. They are therefore good choices for fire protection on islands with both communities with paved roads and unpaved terrain. 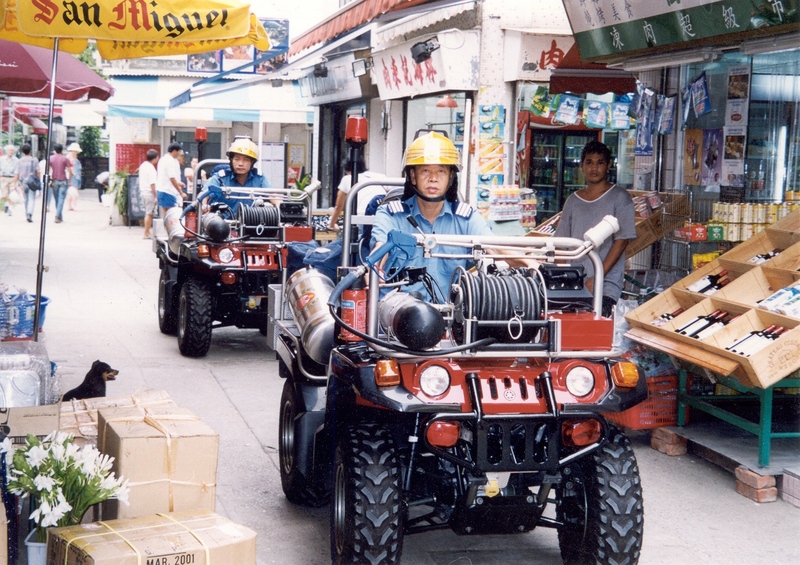 Two all-terrain vehicles of Hong Kong Fire Services Department deployed in the arrow roads of a village on Lamma Island. 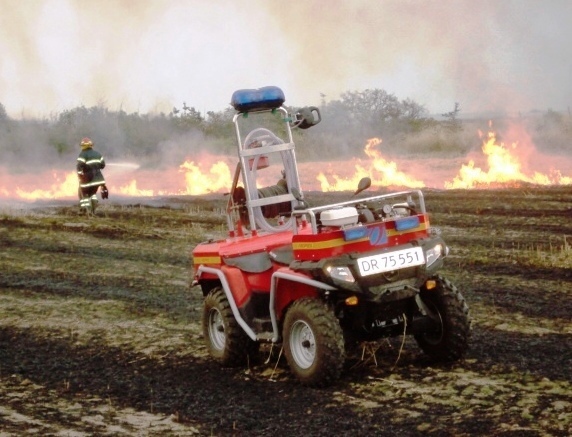 A fire fighting all-terrain vehicle built on a Polaris Sportsman X2 570 used on wild fire on Skaro Island in Denmark.